Ruchess: Taking my first step! Hello everyone, my name is Rucha. I am an international Chess player. I started playing Chess when I was six and a half and now this field is my career. 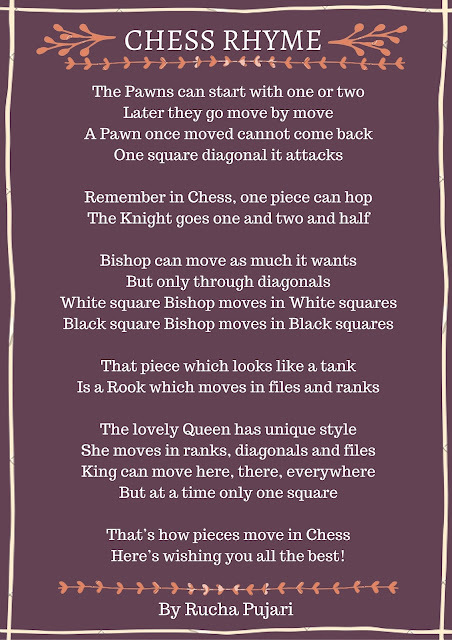 Some people ask me ”Why did you choose Chess?” Looking back I can only say that I never chose Chess. It’s just that I fell in love with this game and then never looked back. On the academic front, I am studying Arts and Literature. For me, I have always believed that academics and Chess should be pursued simultaneously. Even though hard, it is possible to find a balance. I have a strong opinion that education should never be ignored. I like to read, travel and meet new people. I enjoy trying out different activities, like painting, designing, drawing, photography… But then I realized that it is the art of learning that I enjoy the most. And yes, I like to write as well. That’s where the idea of this blog came in. With this post, I am taking my first tiny step into the world of blogging. What topics will you be reading here? That question will remain unanswered by me. Come on, this is just a beginning! Why don’t you keep following and find out? There is Writer Hidden In You ..